What book of advice would be complete with a section on healthy eating and sleeping habits? Here 'Aristotle' instructs the king on moderation and the effects of overeating. 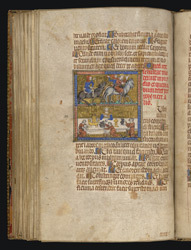 The two-part illustration shows the king riding with courtiers, followed by a moderate dinner. Tableware is not subject to restrictions: a miniature ship in gold and other luxurious items grace his table. The equestrian scene shows details of saddles and bridles as well as a courtier adjusting his headgear.